The Infiniti Q50 comes across as an executive car (well, it is an executive car); it looks like one, feels like one, drives like one, but as you open the door, you might be forgiven for being a little startled to find a Nissan label. The Infiniti Q50 is owned by Nissan, but comes with an engine built by Mercedes. Does it have an identity all of its own? Let’s find out with our Infiniti Q50 review. The Infiniti Q50 is an alternative choice in the compact executive saloon sector, replacing its predecessor, the Infiniti G37, which didn’t go down all that well. Indeed, Infiniti is now 25 years old but still hasn’t really made any waves in the UK market. 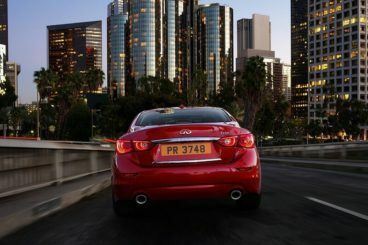 The problems faced by the Infiniti G37 were created by the brand itself; that particular saloon was too alternative, too left-field in its attempt to offer something different. Thankfully, the brand have refined things for the Infiniti Q50, toning down their experimentalism a few notches. Two engines are on offer, but most consumers will most likely opt for the Mercedes-built 2.1-litre diesel unit. There is also an Infiniti Q50 Hybrid variant on offer, a 3.5-litre petrol-electric that serves up a more pleasant experience. But with most consumers opting for the 2.1-litre diesel, it’s worth mentioning that this is a loud engine, but one which comes with a seven-speed automatic gearbox that has a smooth enough shift. Numbers wise, the 2.1 can get to 60mph from rest in 8.7 seconds. 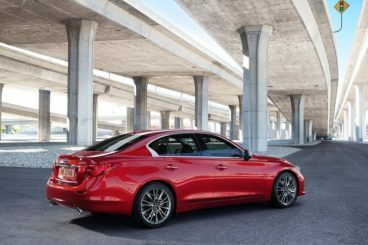 Depending on how you drive your car, the Infiniti Q50 is capable of offering either a noisy, grating experience or a smoother, more pleasant ride. Any Infiniti Q50 review will tell you that this particular model offers pace and performance, whilst at the same time giving you a smooth, pretty much serene driving experience. The 2.1, conversely, strains and crackles itself into hoarseness if you push it hard enough. 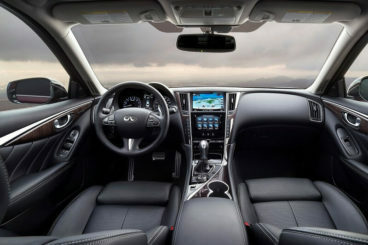 The interior of the Infiniti Q50 comes packed with some features that are of real high quality. As this is an executive saloon likely to be snapped up for company cars, you’d expect an interior that looks premium and that’s pretty much what you get, with the exception of one or two less expensive looking plastic that do let the team down a little. Mercifully, the designers have had the foresight to keep these hard plastics largely out of eyesight. Size wise, the Infiniti Q50’s a tad smaller than its German rivals, which might put it at a disadvantage as it seeks to wrest some consumers away from these popular and enduring executive saloons. Space inside is not massive and you certainly don’t feel swamped by a sense of roominess, whilst legroom at the back is a bit on the cramped side. Upfront, though, seats are remarkably comfortable, whilst there is no doubting the quality of the leather upholstery. The front really is a place of executive luxury. The boot is – to put it bluntly – oddly shaped, leading to a struggle to jam your items in. The Infiniti Q50 price range starts at £27,950, with Infiniti Q50 deals rising to about £37,030. Options in the range include the Infiniti Q50 Sport and Infiniti Q50 Hybrid. Running costs are good, with fuel consumption officially standing at 64.2mpg, though we’d argue that it might be hard to achieve figures that good, with the likelihood that you’ll be looking at numbers more like 52.5mpg. Green-wise, it does figure favourably, emitting just 114g/km. Breaking the stranglehold the German manufacturers have on the compact executive saloon segment is no mean feat, but credit to Infiniti for giving it a second – and better – go with their Infiniti Q50. It does still come up short in one or two areas in comparison to the BMWs, Mercedes and Audi’s of the world, but there are things to admire too; handling is good, as is the interior and ergonomics. 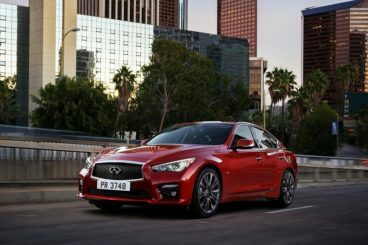 More refined than its predecessor, the Infiniti Q50 might surprise a few people. If you want to get hold of the new Infiniti Q50 don’t hesitate to leave us a message on our contact page, or give us a call on 01903 538835 to find out more about our Infiniti lease deals.